Welcome to The Buoys, a West Coast haven where love comes in with the tide. Perfect for readers of Jill Shalvis and Susan Mallery, the Fishing for Trouble series features three unforgettable brothers—each of whom is a great catch. Major league pitcher Liam O’Donnell knows his best days are probably behind him, but that doesn’t mean he’s ready to retire and become a fishing guide. Still, after all the time he’s spent chasing his dreams, he owes it to his brothers to pull his weight around the lodge. The Buoys is their father’s legacy, and they can’t let some developer take it from them. The one snag Liam isn’t counting on is a blast from the past: his ex-wife. The moment Kate Hadley steps out of the seaplane, she knows this assignment is going to be trickier than she thought. She has to persuade the owners to sell—and one of them is Liam O’Donnell. Ten years ago, she made the biggest mistake of her life when she married Liam during a fling in Vegas. Now he’s her only lifeline in the middle of nowhere. Kate’s trying to keep things cool, but Liam just reminds her of the scorching few nights they spent together—and tempts her to make new memories that are just as steamy as the old. They were almost to her cabin when she shocked the hell out of him by slipping her hand under his arm and nudging his shoulder with hers. Liam blinked hard, then leaned in and pressed a slow kiss against her cheek. Half an inch, that’s how close he was to those soft, warm lips he remembered all too well, but no matter how much he ached to taste them again, he forced himself to pull back and smile down at her. Besides his agent—who didn’t count, because Liam paid him to say it—Kate was the first and only one to even suggest he might have something left, and if she’d said it any other time or any other way, he might not have believed she was sincere. But looking at her now, with her foot up on the porch, ready to go inside, there wasn’t the slightest trace of doubt in her eyes, just those damn bits of amber flickering like little beacons. Kate Hadley needs to prove herself within her company and to do that she needs to do manual labor. Her assignment is to fix up The Buoys to get it ready to sell. When she steps off the plane, she knows this is going to be the hardest assignment she's ever had. She comes face to face with her ex-husband, Liam. He was her husband for all of a minute when he decided that baseball was more important. Before they got married, they barely knew each other. It was a quickie Vegas wedding that ended in heartbreak for Kate. Now he's recovering from an injury and baseball is forced to take a backseat. They are thrown back together to work to fix up his father's legacy. Will they be able to work together? Will the sparks that once brought them together be able to do it again? Off the Hook is a sweet read. The romance takes center stage but there is a lot of work detailing the secondary characters. I realize this is to push into the next book in the series, but at times it felt like they overshadowed the main characters. Kate Hadley is out to prove to her boss that she can handle anything, and when she receives an unexpected assignment she gets her chance to prove her worth. She’s been assigned with fixing up an old fishing retreat, The Buoys. What she doesn’t plan for is the fact that the owner of the Buoys is her ex-husband. Liam and Kate met in Vegas 10 years prior, and after spending a week together, were married, only for Kate to wake up the next morning alone. Kate never hears from Liam again other than the divorce papers he has mailed to her; now, 10 years later, upon seeing one another, the sparks are still there. Liam was a star baseball pitcher until an injury mostly ended his career, now he’s helping with The Buoys while waiting for a call back to the big leagues. Now, though Liam doesn’t want to work with his ex, they need the help too badly to turn her away and they’re forced to work together…which also brings up old feelings. I did more skimming than I would have liked in this book. It has a good start, but the middle dragged a bit. I really love Kate, her smart mouth had me cracking up several times. I also really enjoyed Finn’s part in the story, I hope he gets his own book. Kate and Liam’s relationship was slow to develop in this book, but once it does, the book picks back up and has a strong ending. This is an absolutely lovely book – and clearly the first in a series which is going to be a big hit. Sometimes first books are too busy with building up the environment and characters, but this just smoothly takes us into the story and reveals things very naturally. I loved the banter between the characters – Ms. Drewry has a wonderful talent for writing cheeky, snarky conversation, as well as flirtatious chats. Kate is a very interesting person, as she recognises how hardship and Vegas made her grow up and make something of herself. So even if she was deeply hurt by his actions, she learned and moved forward. Her power to forgive and be empathetic was heartwarming, and also brought the brothers up short. So many lovely little scenes which come to mind when I think of the story, which together created a group of people who feel very real. The wariness that Liam and Kate display as they work together, and yet how the tasks help them find the time to get to know each other, make the buildup both inevitable and also all the sweeter. They certainly have plenty of years to make up for, and do so enthusiastically! The twists in the business side of things are just as important to the outcome as the baseball is, combining perfectly to make this a love story with a great resolution, and a wonderful set up for the next book. USA Today Bestselling author, Laura Drewry had been scribbling things for years before she decided to seriously sit down and write. 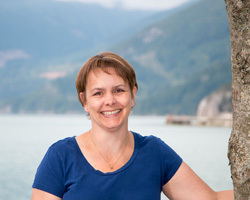 After spending eight years in the Canadian north, Laura now lives back home in southwestern British Columbia with her husband, three sons, a turtle named Sheldon, and an extremely energetic German shepherd. She loves old tattered books, good movies, country music, and the New York Yankees. Follow the Off the Hook Blog Tour HERE. 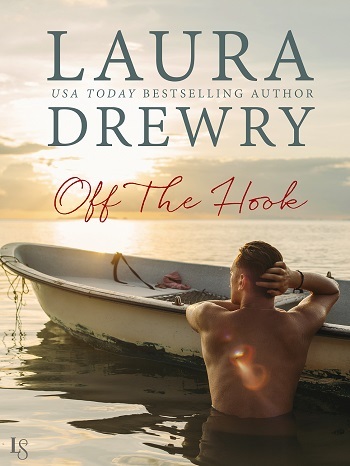 Reviewers on the Wicked Reads Review Team were provided a free copy of Off the Hook (Fishing for Trouble #1) by Laura Drewry to read and review for this tour. Lovely reviews. Thank you for hosting OFF THE HOOK today!